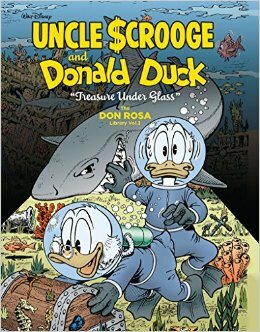 I got the latest Don Rosa collection, Treasure Under Glass, on a Tuesday. I was done that Thursday. 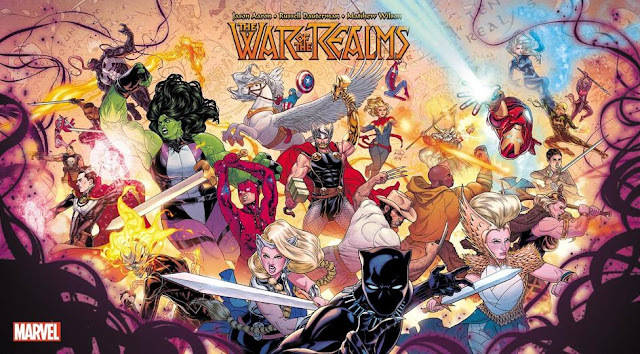 That very same evening I acquired Treasure Under Glass, I was talking to a friend about another set of comics (that's not important right now), and the general criticism of "It reads like fan fiction." I expressed to him that I was not really comfortable using that particular phrase as criticism, since you could apply it to anything regardless of quality. Don Rosa continues to treat me with comics that could easily be regarded as fan fiction based on the works of Carl Barks, and why wouldn't they be classified as such? Clearly, he is Barks' #1 fan. "I'll be the first to agree that doing an add-on to some venerated Cal Barks classic does not necessarily do it honor! Those stories don't need sequels! They are complete and time proven! And yet... what could be more thrilling for me than to find myself telling a "book two" of a beloved tale that I grew up reading over and over again? Even now the idea gives me goosebumps!!! I am too weak to resist that offer... Sorry! Well... I'm really not sorry-- I love these sequels!" Fortunately for us, Rosa despite his claims is a great cartoonist, and the end result is always entertaining and is always worth the read. Let's look at them one by one. The stories in Uncle Scrooge and Donald Duck: Treasure Under Glass first appeared in various titles throughout Europe (Sweden's Kalle Anka & C:o,Germany's Mickey Maus, Norway's Donald Duck & Co., and Denmark's Anders and Ekstra), from November 1990 to January 1992. The Master Landscapist. Donald gets a job as a landcapist, and he's actually pretty good at it! With an offer to decorate the Mayor's garden for a big fox hunt, Donald does a marvelous job. So of course, things go wrong. This story's short, but it's worth it just to see what Donald does with the garden. Very visually entertaining. On Stolen Time. The Beagle Boys manage to find a way to freeze time — you have to be within 50 feet of them to be unaffected — so they use this time to steal money from Scrooge's money bin. Donald and the boys chase after them, trying to keep within 50 feet at all times. Again, very visually entertaining — at one point, the Beagle Boys climb a bunch of birds beginning to take flight as a stairwell! Return to Xanadu. This story starts out as a sequel to an old Carl Barks story (yet to be rereleased by Fantagraphics) in which Scrooge and family find the lost crown of Genghis Khan. Turns out the crown is part of a larger treasure, and pretty soon they're on their way to find the rest of it, finding themselves in the middle of an underground river Alph, which the boys instantly recognize as the river that leads to Xanadu, the place where Kublai Khan held an empire, immortalized in a 19th century poem by Samuel Taylor Coleridge. But the closer they get to Xanadu, the more they feel that something is familiar! If you've read the Barks work this turns out to be a sequel to (and I have), it's quite trippy — they're legitimate mark-out moments that even had my niece laughing as she recognized the references. (Incidentally, I'm really surprised that she remembered every detail of the original story, since we read it months ago.) Another thing I find interesting is that this being a sequel to that unnamed story was supposedly an accident! Rosa wanted to set a story in Asia and use the Khan Empire as a starting point. This led him to Coleridge's poem, which just ended up describing an already established Barksian setting. Either Barks was aware of the poem beforehand, or it's just storytelling magic. For the fun of it, I will believe in storytelling magic! The Duck Who Fell to Earth. The weakest story in this volume has Scrooge and Donald going into space to catch falling satellites. That's all I'm gonna say about it; I wasn't a fan of this one. It just felt like Rosa had an idea and had to fill some pages with it and he ran out of material pretty quickly. Incident at McDuck Tower. Donald gets a job as a window washer at one of Uncle Scrooge's buildings, but, while showing off (a recurrent Rosa theme, even more than Barks: no matter how good Donald gets at something, actually being confident is going to ruin him) he falls. I could describe it further, but I'll just let this sequence speak for itself. It's not my favorite story in the collection (that would be Return to Xanadu) but it illustrates what no other comic really gives me: that visual energy that goes into these gags for the purposes, really, of it looking amusing. It's great slapstick fun and this story has a great punchline! The Island at the Edge of Time. A new island forms and its composition is basically all gold, bringing the two richest ducks in the world, Scrooge McDuck and Flintheart Glomgold, to go after it. Not much to write home about, although I will say that this story features the Philippines, and we weren't portrayed as racial caricatures, so... yay? War of the Wendigo. Another sequel to a Barks story (that I haven't read yet), this three-parter may open up a can of worms. It's an environmental story (Scrooge's pulp mill in Canada is destroying the environment) that features the Peeweegah Tribe — a tribe of little Native American people. It's this story that caused the delay of the release of this book, since Rosa drew them in the art for the back cover, and Fantagraphics asked him to remove it. And they are stereotypically portrayed; they wear feathers and war paint and talk about the great nature spirit. If this offends anyone, I get it, but from where I sit, they're portrayed as the good guys, they teach good things, and they're incredibly competent. They bring out both the angriest and most valiant sides of Scrooge, and it's a dramatic story that tugs at the heartstrings. Super Snooper Strikes Again. The sequel to Barks' classic, "Super Snooper," in which Donald accidentally gained superpowers has... Donald purposefully gain superpowers to impress the boys. But he keeps screwing up, and nothing he does to impress them goes noticed. It's only a matter of time before his powers run out, but the boys end up learning a lesson anyway with regular, mundane Donald. Treasure Under Glass is great fun, visually entertaining, and continues to be a beautiful tribute to Carl Barks' stuff. And yes, sometimes it reads like fan fiction, in the sense that Don Rosa is a fan doing a tribute to the works of his favorite cartoonist. And what's wrong with that? Quality is quality. And Don Rosa is great.